The Adventure Starts Here: A Weekend Full of Digging! 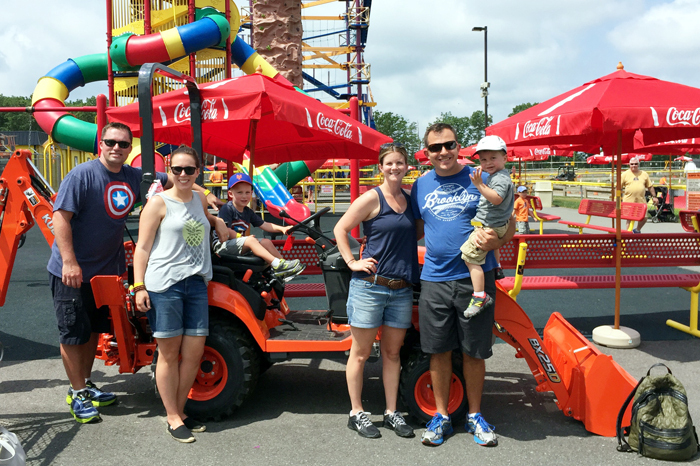 This weekend, we had an amazing time with one of our favorite families. Not only was I lucky to find a great friend, but our kids and husbands get along really well too. While I am so bummed that they moved a few hours away, I'm thrilled that it gives us the excuse to have these weekends filled with so much fun! Last fall, we visited them in Massachusetts and went to Thomas Land. 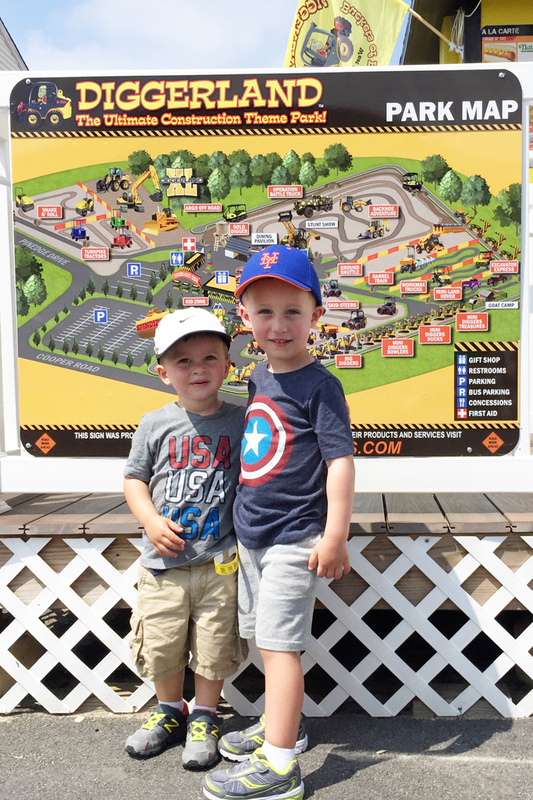 We invited them to come stay with us this summer and suggested taking the kids to Diggerland. Plans evolved from there, and they once again so graciously hosted us instead! They ended up inviting us to come down to Ocean City (NJ) for the weekend, where their family has a beach house. 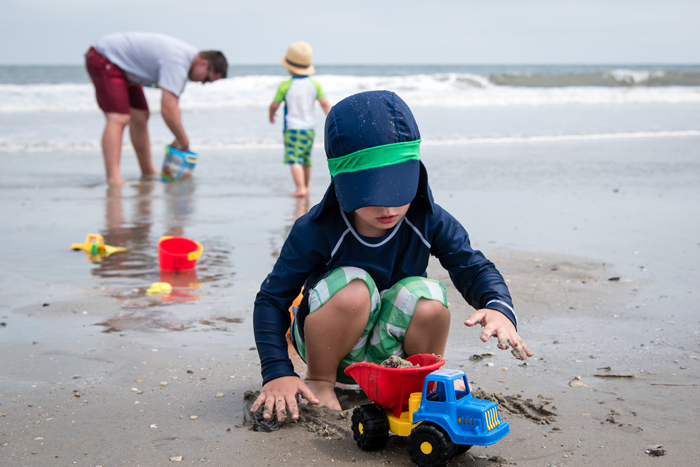 So while we still did Diggerland, we also were able to go to the beach, boardwalk, and pick up as if it hadn't been almost 7 months since we had seen them last! Weather was a little wacky this weekend. It was overcast on Friday, very hot and sunny on Saturday, and foggy and rainy on Sunday. My friend's husband, Chris (we know way too many Chrises! ), had to work from home on Friday, so the plan was to go to the beach on Friday and then do Diggerland on Saturday. So we had a cloudy day at the beach (while not what I had envisioned definitely has its perks!) and then sweat our butts off at Diggerland the next day. The boys were such troopers and we just made sure to apply lots of sunscreen and keep them hydrated. Needless to say we weren't surprised when they both fell asleep as soon as we started driving home! 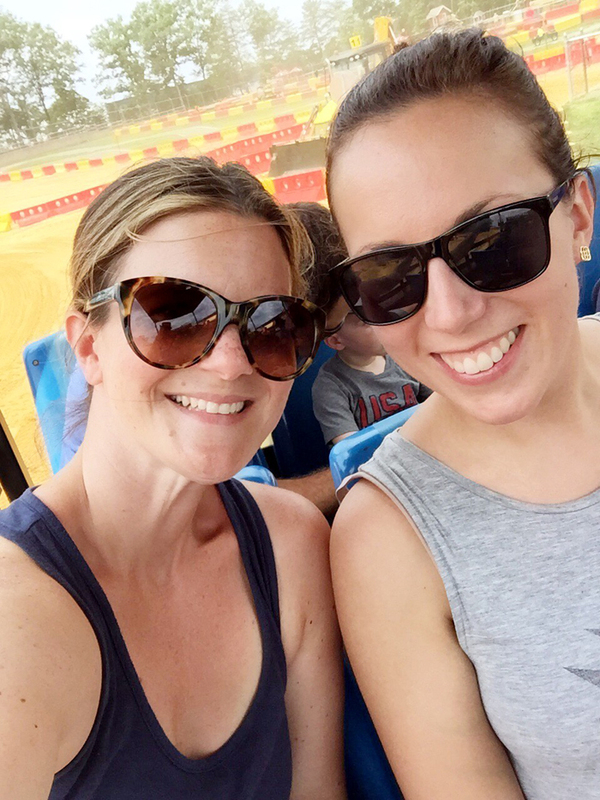 This was our second time at Diggerland (and their first) and we had just as much fun as last time! 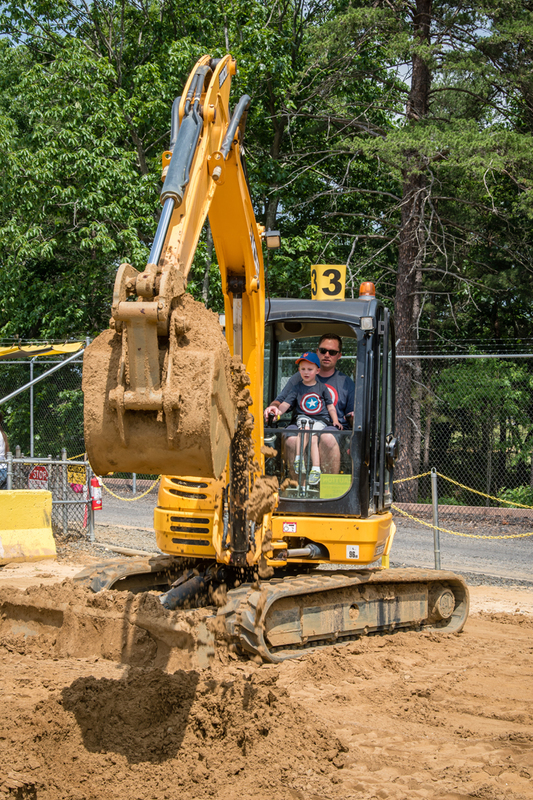 Just like last time, we dug big holes with the excavator and rode a few big trucks (as the driver and passenger). 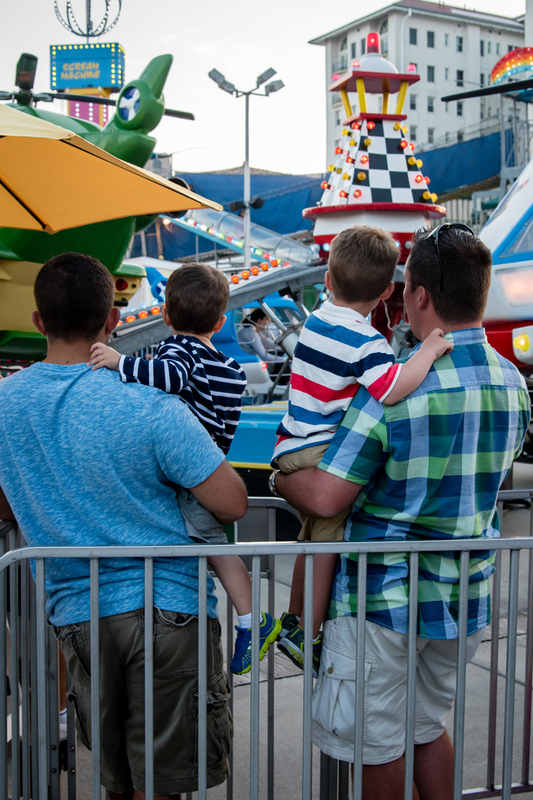 We even let the boys play in the arcade, where Noah was the luckiest kid ever and won so many "tickets" to cash in for numerous prizes (for both he and Quinn)! On Saturday, we got to the park a little early and were pleasantly surprised to see that a Home Depot was right around the corner. My Chris remembered that there was a Kids Workshop going on, so we stopped by to do a quick project. While we do these a lot at home, this was the first time for Quinn and his dad. 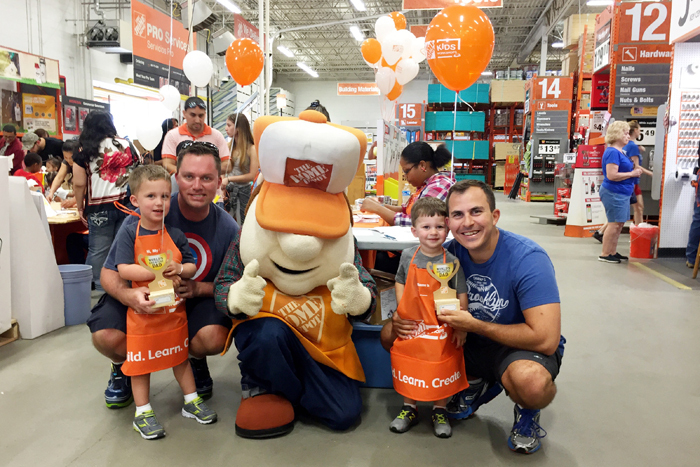 Chris and I were extremely impressed with how this one was run... plenty of tables and chairs set up (we often have to sit on the floor at ours), balloons, popcorn, and face painting for the kids, and the Home Depot mascot (Homer D. Po) was there for a photo op too! The rest of the weekend was spent back at the beach. Our friends' parents live down there year round and have a beautiful house right on the water. Our friends go down for a few weeks each summer and were nice enough to let us join in on the family fun for a couple of nights. 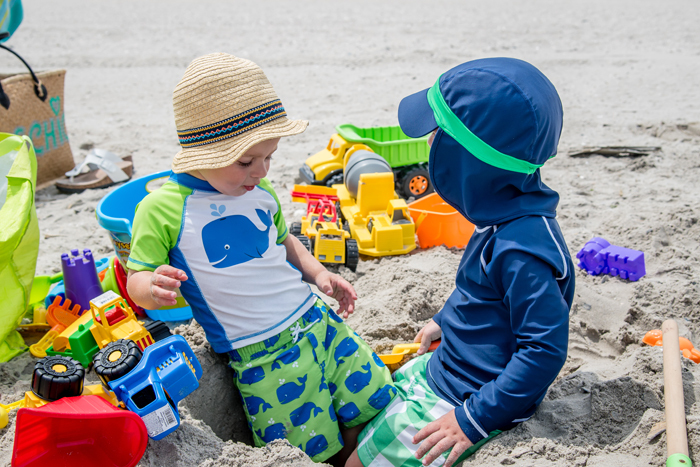 The boys were so excited to see each other and had a blast playing together, whether it was digging in the sand or just around the house. Both mornings, Noah woke up so excited to go play with Quinn and was very upset when we had to leave... he kept asking for "one more hour". While they are a year apart, they got along really well. 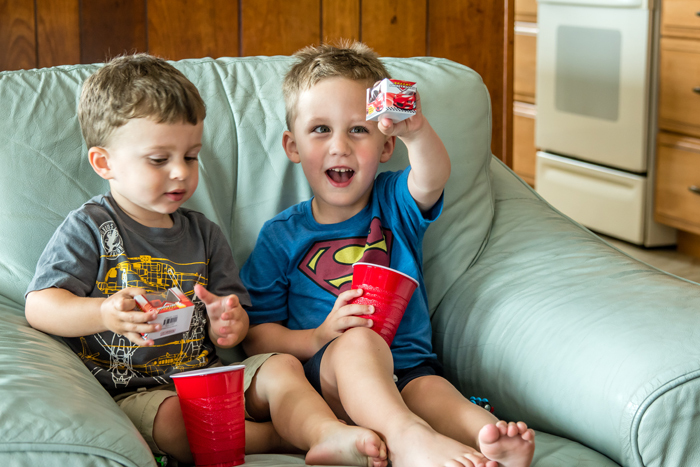 We of course had a few sharing issues, but what can you expect from a 2 and 3 year old who were getting a little tired from our weekend full of excitement and fun! 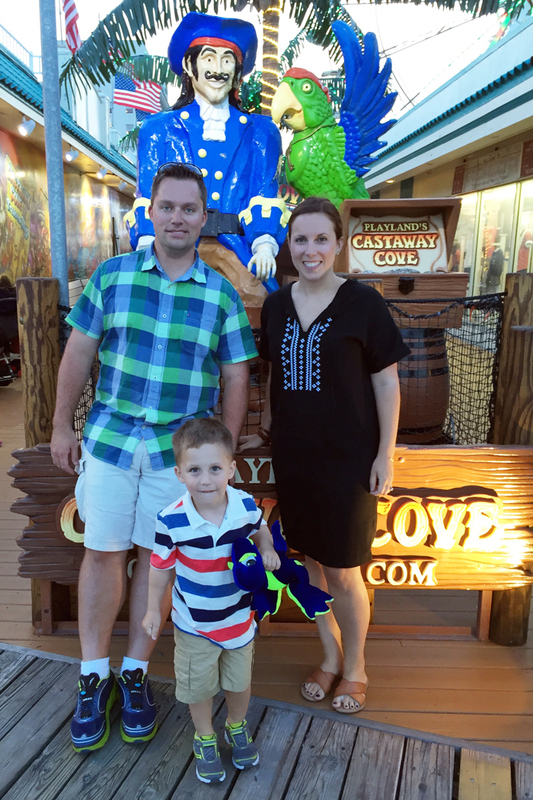 No trip to the beach would be complete without going to the board walk. So Saturday night we headed over there after dinner for some rides and ice cream. 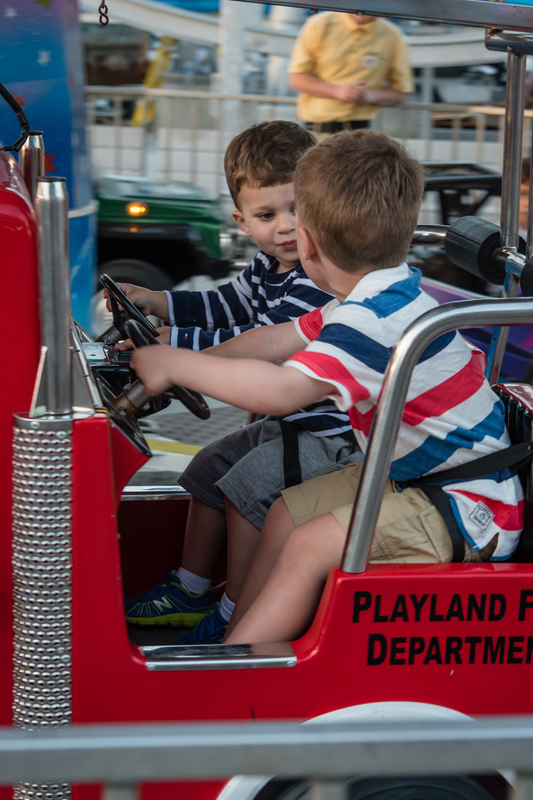 Noah had such a fun time going on rides with Quinn, that is until they went on one that was just a little too fast for him, especially when they whipped around the corner. Thankfully a few hugs and kisses, and winning a stuffed dinosaur at a carnival game, made it all better and he was back to his happy self! We had a wonderful weekend and it made me really excited for summer! I was however, quickly reminded of what the humidity does to my hair. I am now on a mission to find a few hair styles that will work this summer. That, or I need to stock up on lots of hair ties and hats... this humidity is really no joke! What a fun weekend! The boys looks like they had a blast! What a fun weekend! Diggerland looks like a blast. It's such a treat to spend time with great friends. I love when a friend I make has a hubby and kids that mine like. It's such a plus. The beach pictures are so great! I saw all that digging on your snaps! What an awesome place! I've heard of Diggerland but never been there! What a fun weekend! I've heard good things about Diggerland and I've been wanting to take Mila. Maybe this summer. Does it get very crowded? Great photos - I especially love your family shot at the end! What a perfect weekend with friends and Diggerland looks like it would be a hit with boys of all ages :D! What a super fun (yet super busy) weekend! I know Ben isn't quite old enough yet, but OMG I already know he would LOVE Diggerland & I know my husband would be in hog heaven too! What a perfect theme park for Noah! I swear I would never know this place even existed being a girl mom lol. You had a wonderful weekend and more where that came from, am I right?! Yay for summer! It looks like a great weekend! I've always wanted to do one of the Home Depot Kid's Workshops. 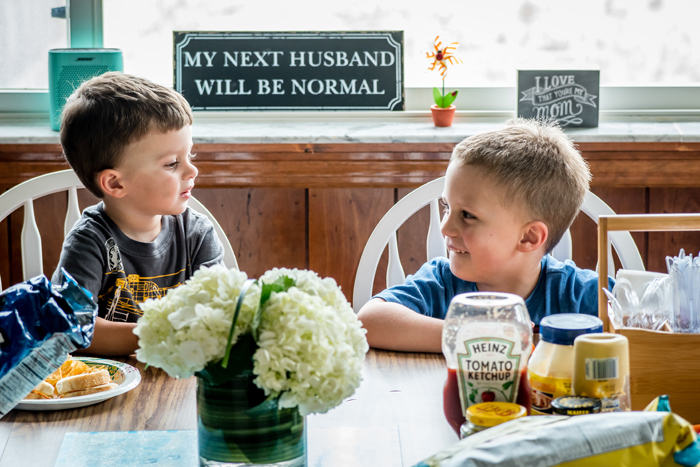 I know this was just in the background, but I LOVE the sign that says "My next husband will be normal" haha so funny! 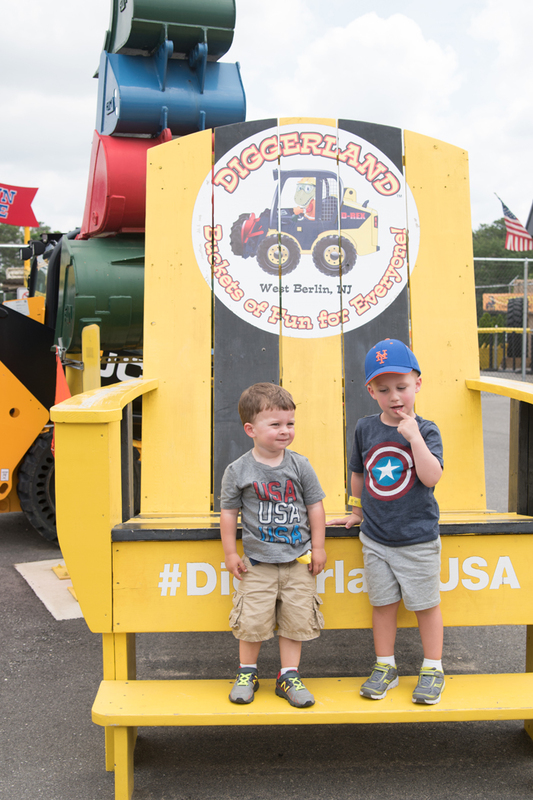 Diggerland sounds like every little boy’s dream! What a fun and neat place. We don’t have anything like that around here. So great that you guys were able to throw in a quick and fun Home Depot workshop. I’ve never seen their mascot. You got the greatest pictures of your weekend trip!